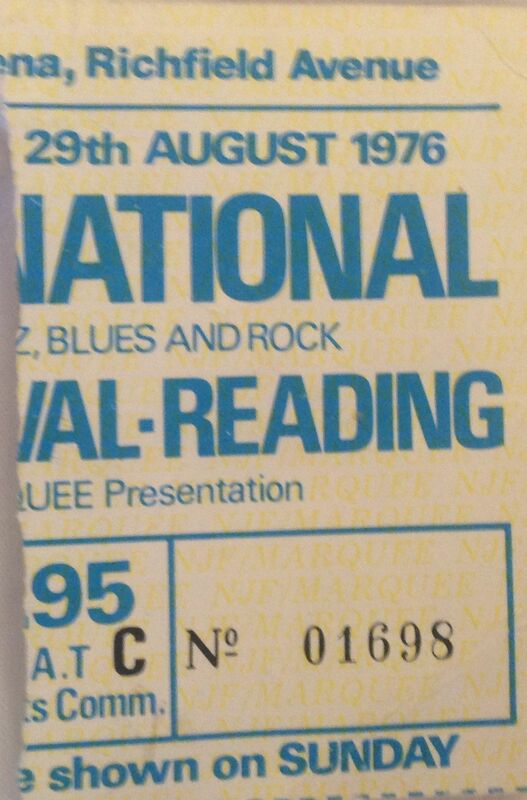 It was August Bank Holiday 1976 and I was back at Reading for the annual festival. By now a group of us went every year, usually traveling down in the back of a hired transit van. The line-up for this festival wasn’t as strong as previous years, and included a mix of reggae, classic rock, underground and heavy metal bands. 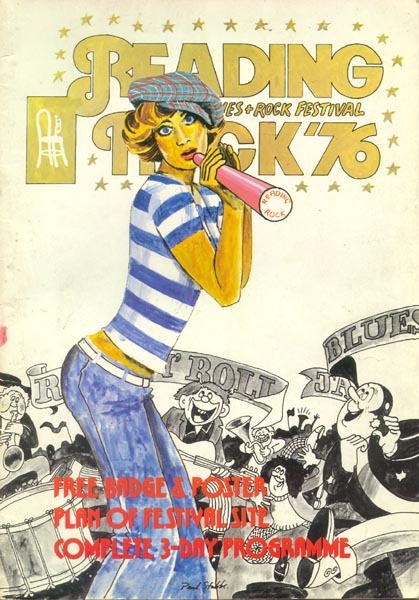 Punk was on the horizon, but yet to break through. The other memories I have are of rain (some, but not lots in 1976, as I recall), mud, lots of drunkenness (by us, and every one else as I remember), and lots (and I mean lots) of can fights, which seemed fun at the time, but were probably actually pretty dangerous. If you got a half-full can of Watney’s Red Barrel on the back of your head, you really knew about it, and several people must have come home from the festival with pretty nasty cuts and scars. The festival was moving from a friendly, hippy vibe to a drunken, laddish, almost aggro vibe. This also matched the way the line-up and the music would develop, as it moved more to heavy metal in the late ’70s. The main attraction for us this year was Rory, who was the man, and a hero to us all. Friday’s line-up consisted of Stallion (don’t recall who they were), Roy St John (American pub rock), U Roy (reggae), Supercharge (a Liverpool band fronted by singer and sax player Albie Donnelly, who had quite a bit of success in the mid-70s and played a lot up and down the country; I remember seeing them several times), Mighty Diamonds (reggae), Mallard (Cpt Beefheart’s original Magic Band, and pretty good too) and headliners the hippy, trippy and quite weird Gong. I remember watching Mallard and Gong, who were both pretty good. Saturday had Nick Pickett (a folk singer, who I’d seen supporting Curved Air a few years earlier), Eddie & The Hot Rods (classed as pub rock as much as punk at this stage), Moon, Pat Travers (ace guitarist), Jon Hiseman’s Colosseum, Sadista Sisters, Manfred Mann’s Earth Band, Van Der Graaf Generator, Phil Manzanera and the 801 band, Camel and Rory Gallagher. Stand outs for me were Van Der Graaf who played an amazing extended version of Killer (John Peel: “Bloody marvellous, Van der Graaf Generator. Come on let’s here it for them”), Manfred Mann, and Phil Manzanera and the 801 band, which was seen as a pretty big deal at the time as Phil had assembled a stella line-up of himself (guitar), ex-Roxy compatriot Brian Eno (keyboards, synthesizers, vocals), Bill MacCormick (bass, vocals), Simon Phillips (drums), Francis Monkman (ex-Curved Air, piano and clavinet) and Lloyd Watson (ace slide-guitar, vocals). The 801 band released one album, and a live lp which was recorded at one of three gigs that they played, at the Festival Hall. They played a great version of the Beatles’ Tomorrow Never Knows. But Rory was the highlight of the weekend. We were all massive fans, and made our way to the front of the crowd for his set, which was just amazing. 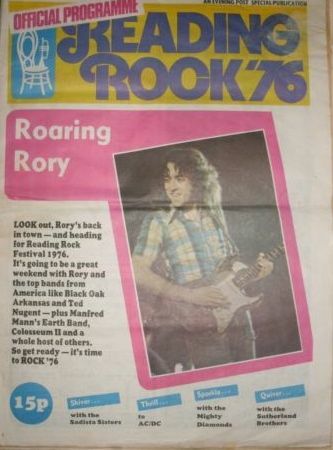 A recording of Rory’s set that night exist which shows that he played: Take What I Want; Bought and Sold; Everybody Wants To Know; Drinkin’ Muddy Water; Tattoo’d Lady; Calling Card; Secret Agent; Pistol Slapper Blues; Too Much Alcohol; Souped-Up Ford and Bullfrog Blues. The Rory Gallagher band was Rory (guitar, vocals), Lou Martin (keyboards), the great Gerry McAvoy (bass) and Rod de’Ath (drums). Sunday featured: Howard Bragen; Aft; The Enid (who got the crowd singing along with Land Of Hope And Glory and became a festival favourite), A Band Called ‘O’; Back Door (very jazzy); Sassafras; Brand X (featured Phil Collins on drums); AC/DC (one of their early UK appearances, and just blew everyone away; Angus and Bon Scott on top form); Sutherland Bros & Quiver; Ted Nugent (had some arguments with the crowd who were throwing cans at him); Black Oak Arkansas (Jim Dandy to the Rescue 🙂 ) and Osibisa (who were billed as special mystery guests, which seemed a bit of a let down, but got the crowd going and went down well). Note; for the first time there was an official glossy programme, as well as the newspaper programme, produced by the local Evening Post. Both are pictured here. 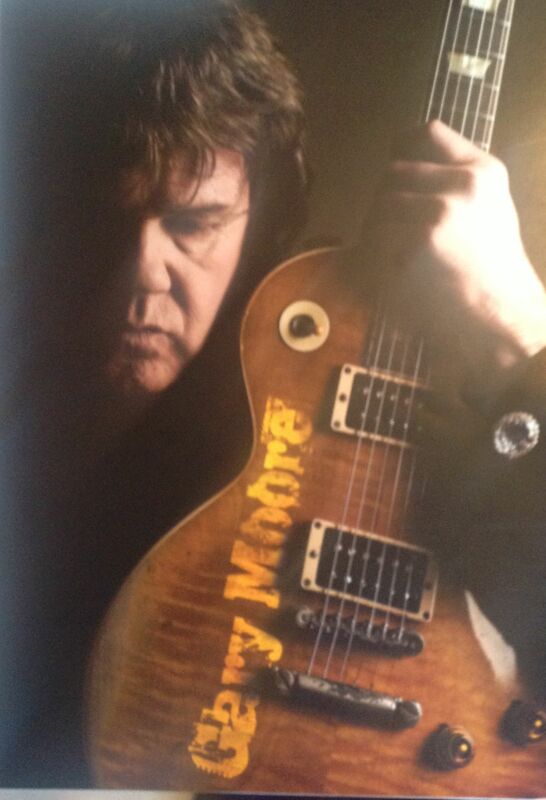 I first saw Gary Moore live when he was in the Irish rock band Skid Row, at a gig at Sunderland Locarno in early 1971. I remember standing on the dance floor, right in front of the stage, close up to Gary. He was a young man of 18 then, and his guitar work was simply astounding. His technique mixed the feel and tone of great blues guitarists like Peter Green and B B King, with the flash and speed of Alvin Lee. You could also hear the jazz influences in Moore’s playing and in the music of Skid Row. 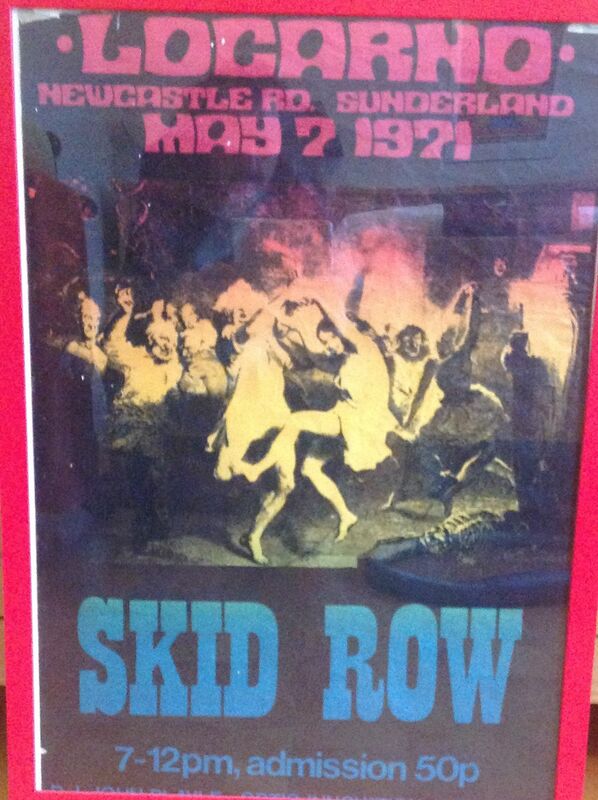 There was another reason why Skid Row stood out from the crowd, and deserved much more success than they ever got, and that was manic bass player Brush Shiels. Brush has a mop of afro hair (guess that’s where his name came from), played a see-through perspex bass, and ran around the stage like the proverbial whirling dervish. I saw the band once more, after Gary had left to be replaced by Paul “Tonka” Chapman, when they supported Curved Air at a gig at Newcastle City Hall. 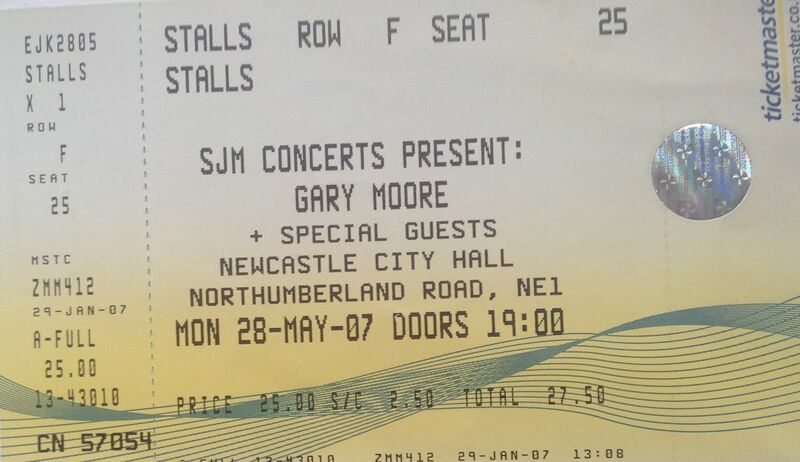 I saw Gary many more times over the years: in his own Gary Moore Band as a support act at the City Hall (I think it could have been on a bill with Stone the Crows), with Jon Hiseman’s Colosseum II at Reading Festival in 1976 and at a gig at Newcastle Poly, and with Thin Lizzy once or twice. I also saw him supporting Whitesnake on tour (his band was called G Force at that point) in 1980, and solo at Donington Monsters of Rock 1984. 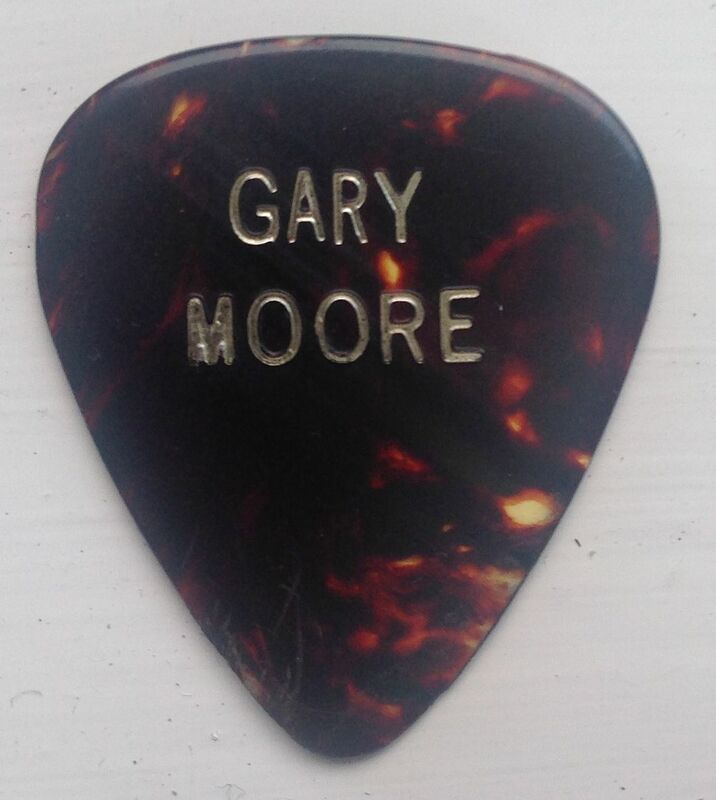 Typical Gary Moore set list from 2007: Oh, Pretty Woman; Hard Times; Trouble at Home; Since I Met You Baby; Midnight Blues; Eyesight to the Blind; Thirty Days; All Your Love (I Miss Loving); I Had a Dream; Too Tired; So Far Away; Empty Rooms; Don’t Believe a Word; Still Got the Blues; Walking by Myself. Encore: The Blues Is Alright; Parisienne Walkways.